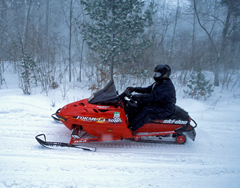 Year after year, the same factors keep turning up in snowmobile fatalities. DNR snowmobile administrator Gary Eddy says alcohol use is one of them. “We want people to go out and enjoy themselves and have a great time,” Eddy says. “But that should not involve excessive alcohol, ever. Take your safety and also the safety of others out on the trails into consideration. Eddie says another concern which contributes to snowmobile deaths is excessive speed. Many crashes happen at night when riders overdrive their headlights, so that by the time they see an obstacle, it is already too late to stop. Eddy also says to be wary of ice conditions, even with recent cold weather.